CAMP TAJI, Iraq, Aug. 19, 2010 — Through the dusty driver’s side win­dow, Army Pfc. Thomas John­son could see the final stretch of dirt road lead­ing to the bor­der. 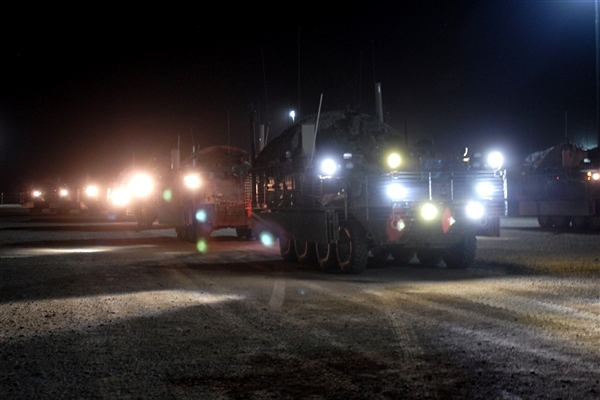 Stryk­er armored vehi­cles with the 2nd Infantry Division’s 4th Stryk­er Brigade Com­bat Team line up at a fuel­ing site at Camp Taji, Iraq, Aug. 17, 2010, to receive fuel before head­ing out on a two-day mis­sion to leave Iraq through Kuwait. As one of the lead ele­ments in a com­pa­ny-size for­ma­tion of Stryk­er armored vehi­cles, John­son and Army Spc. Adam Porter -— both com­bat engi­neers with 38th Engi­neer Com­pa­ny, attached to the 2nd Infantry Division’s 4th Stryk­er Brigade Com­bat Team — had dri­ven col­lec­tive­ly more than 400 miles on the unruly and some­times dead­ly roads from here to Kuwait in a mine-resis­tant, ambush-pro­tect­ed vehi­cle. Sol­diers of the 4th Stryk­er Brigade Com­bat Team have just com­plet­ed a year­long tour sup­port­ing the U.S. Divi­sion Cen­ter area of oper­a­tions in and around Bagh­dad, assist­ing, train­ing and advis­ing the Iraqi secu­ri­ty forces. As a mem­oir of the last full com­bat brigade in Iraq dur­ing Oper­a­tion Iraqi Free­dom, which comes to a close at the end of the month, the rest of the crew said their final good­byes to Iraq into their dig­i­tal cam­eras before enter­ing Kuwait and end­ing their final deploy­ment to Iraq. The team of com­bat engi­neers helped to clear the way for the sym­bol­ic con­voy out of Iraq, rem­i­nis­cent of U.S. forces first push­ing into Iraq at the begin­ning of Oper­a­tion Iraqi Free­dom, dri­ving down a route sim­i­lar to the one ser­vice­mem­bers entered the coun­try through in 2003. The brigade’s depar­ture leaves 56,000 U.S. ser­vice­mem­bers in Iraq. When Oper­a­tion Iraqi Free­dom ends Aug. 31 and the civil­ian-led Oper­a­tion New Dawn begins Sept. 1, that num­ber will be down to 50,000. That’s when the U.S. mil­i­tary mis­sion in Iraq offi­cial­ly changes from com­bat to an “advise and assist” capac­i­ty, com­plet­ing a tran­si­tion that has long been under way. Most of the Stryk­er brigade sol­diers, includ­ing John­son and Porter, said they did not expect to leave Iraq behind a steer­ing wheel, dri­ving to Kuwait. But the mode of exit didn’t mat­ter to the sol­diers, as long as it meant they were return­ing home soon. While peo­ple in the back of Stryk­ers and MRAPs had the oppor­tu­ni­ty to nap dur­ing the two-day trip, the gun­ners, dri­vers and vehi­cle com­man­ders stayed awake, focused and alert to their sur­round­ings. Ener­gy drinks, day­time naps and casu­al con­ver­sa­tions among crew mem­bers kept the weary dri­vers going. “I was think­ing about doing my job pro­fi­cient­ly and get­ting every­body there safe­ly. If I don’t get every­one there safe­ly, then we fail the mis­sion. And I’m all about com­plet­ing the mis­sion,” said John­son, men­tion­ing that part of his mis­sion was return­ing home to his wife. The team made it with­out hav­ing to deal with any attacks, a major improve­ment from vet­er­an com­bat engi­neers’ expe­ri­ences dur­ing ear­li­er rota­tions. Because secu­ri­ty has improved over time as Iraq has become more sta­ble, cer­tain aspects of lat­er deploy­ment cycles have changed as well. “Yeah, we trained to kick in doors, we trained to clear build­ings, we trained to react to con­tact, but every sin­gle one of us knew what we were going to be doing — rid­ing in a truck look­ing for [road­side bombs],” Porter said. For John­son, a Phoenix native, and Porter, from Ash­land, Wis., train­ing for dri­ving the Buf­fa­lo-style MRAP — a large vehi­cle with a mechan­i­cal arm for check­ing poten­tial threats — began dur­ing the brigade’s June rota­tion at the Joint Readi­ness Train­ing Cen­ter at Fort Polk, La. Sol­diers trained on a 5-ton truck frame with a Buf­fa­lo cab weld­ed onto it. It was not until arriv­ing in Iraq they had an oppor­tu­ni­ty to get behind the wheel of the real thing. A year lat­er, as John­son drove his team past the gates lead­ing to Kuwait and con­clud­ing their last patrol in Iraq, he said he felt a long-await­ed feel­ing. “It’s a feel­ing of suc­cess that you did what you were expect­ed to do for a whole entire year, then com­ing to the end of your tour and fin­ish­ing it out strong,” he said.